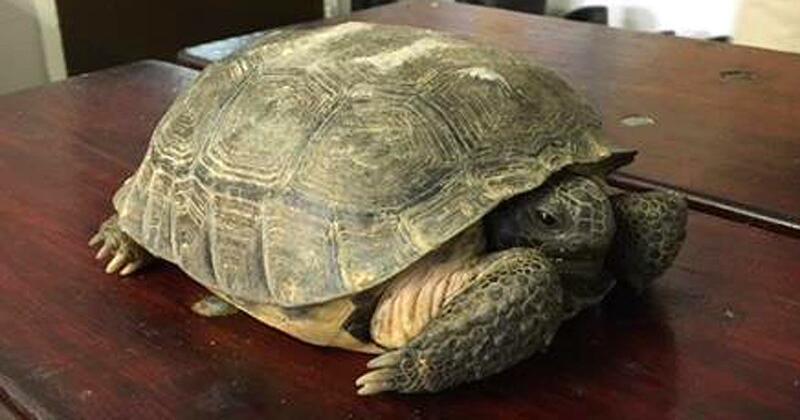 DOTHAN, Ala. (WDAF) – A tortoise set on fire during a live Facebook video is doing well and will be sent to a wildlife sanctuary, according to police in Alabama. The Dothan Police Department began looking into what happened to 'Leonardo' Wednesday night after receiving multiple complaints . Ultimately, officers found and arrested the 19-year-old who begged for likes on his video before setting the animal on fire. The department said Leonardo was doing well as of Thursday morning. Alabama Game and Fish are involved in the case, and they are taking care of transporting the reptile to Big Bend Wildlife Sanctuary in Enterprise. He will undergo rehabilitation there and ultimately be released into the wild. By the way, the Alabama Game Wardens office has identified Leonardo as a gopher tortoise (Gopherus Polyphemus), which are listed a "threatened" in the endangered Species Act. They are protected in the state of Alabama. Police said 19-year-old James Terrance Allen was charged with aggravated animal cruelty, which is a felony, following the incident Wednesday. An investigator with the Dothan Police Department tells us the Alabama Game Wardens also plan to charge Allen in the crime, but that charge will be a misdemeanor.